Reacts with nNOS. Cross-reactivity with iNOS or eNOS not known, but not expected. conjugated to KLH by a Glutaraldehyde linker, corresponding to amino acids 1409-1429 of Rat NOS1 (nNOS). IHC: Rat brain stem tissue. This antibody is a high quality immunohistochemical reagent that has been used for studies in both the peripheral and central nervous system. It is also useful for double label studies when combined with rabbit or other primary antibodies. Our Abpromise guarantee covers the use of ab6175 in the following tested applications. WB 1/1000. It has been reported that the antibody can give mild background in some instances. Rat brain stem tissue staining for nNOS with ab6175 (1:2000) (perfusion fixed frozen sections). Publishing research using ab6175? Please let us know so that we can cite the reference in this datasheet. with regard to the antibodies that have been tested and guaranteed (especially for ab72428), what rabbit tissues were used, and what was the localization of the staining? using the same tissue will help to at least confirm the reported reactivity. Aside from your own in-house validation, do you have record of publications that use your antibodies? specifically, are there any that use the antibodies that you've suggested in rabbit tissue IHC-P? specifically regarding ab72428, the antigen for the antibody is a pentamer from the nNOS c-terminus. with such a short sequence, is there concern for cross-reactivity, especially to iNOS or eNOS, forexample? thanks for suggesting some other alternative antibodies. Unfortunately ab79051 and ab95436 use a similar antigen to ab6175 and ab1376 (1400-1429 aa region in nNOS), so I would not consider those. ab106417, the last one you suggested, is a rabbit polyclonal. is this an issue when applying the antibody to rabbit tissue? As for ab72428, I will need to check with the lab regarding tested tissue,localization of staining and potential cross-reactivity with eNOS and iNOS. I will letyou know what I find out. Thank you for your patience. As for references, we list them on the online datasheet in a tab called "Specific references" if we are aware of any. Also, customer reviews can contain testing data on new species and those would be listed in the tab "Abreviews" on the online datasheet. Abreviews: wehave not yet received Abreviews from other customers for this antibody. As for ab106417, a rabbit polyclonal, yes, high background due to crossreactivity of the secondary antibody (anti-rabbit) with the endogenous rabbit IgG (just as mouse-on-mouse staining)could potentially pose a problem, but there are ways to get around this. which can be adapted to rabbit-on-rabbit staining as well. I hope this information is of some help so far. I will be in touch with more details soon. Inquiry: I am interested in purchasing an nNOS antibody for use in immunohistochemistry/immunofluorescence in rabbit paraffin sections. A number of your antibodies in your catalog state they have reactivity with rabbit, and have been documented for use in IHC-P. In particular, I am interested in ab3511 and ab72428. ab6175 and ab1376 meet the criteria, but use a similar antigen to another antibody that I tested and didn't work. Have any antibodies in your catalog been documented to work specifically for IHC-P in rabbit tissue? which would you recommend that I try? We have 3 antibodies that were tested and are guaranteed (https://www.abcam.com/Abpromise) for IHC-P and rabbit samples: ab1376,ab6175 and ab72428. I would recommend trying one of thosethat were tested as they are covered under our guarantee. We do not compare antibodies side by side, thus, I have no infomation on which of these antibodies works best in rabbit tissue. If you had unsuccessful experiences with immunogens similar to ab6175 and ab1376, I would suggest to try ab72428. As for ab3511: This antibody was not tested in IHC-P, thus we do not know how well it would work in this application. The testing discount program is for customers who like to use an antibody/protein/kit on an untested species/application. You would purchase the antibody at full price, test it and submit an Abreview with your data (positive or negative). On your next order you will receive a discount for ONE antibody/protein at the full price (100%) of the antibody/protein you have tested, or a full price discount for the amount paid for the kit. The terms and conditions applicable to this offer can be found here: https://www.abcam.com/collaborationdiscount. This programapplies to ELISA kits and other kits we offer. Regarding Ab6175, would you expect this antibody to cross react with rabbit eNOS? All the information available for this product is listed on the on-line datasheet (price, datasheet, publication, suitability, cross-reactivity). What is a good paraffin-embedded tissue to use as positive-control? Thank you in advance. Carlo A. Beltrami, M.D. A positive control tissue for this antibody is the thoracic spinal cord (of rat). 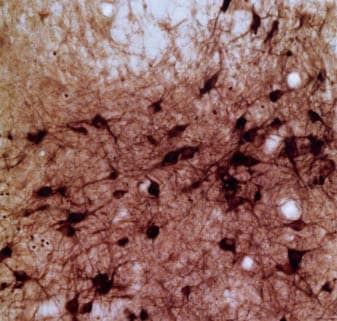 Pre-ganglionic sympathetic neurons stain for NOS. Reading the questions I realized that on the 22 Nov 2000 was asked whether this Ab detects: 1. INDUCIBLE NOS (= iNOS not bNOS=nNOS) 2. in paraffin embedded slices. Only the second part of the question was answered. We cannot provide a definitive answer to this query. However, it is unlikely that our antibody to bNOS recognizes inducible NOS. I require an antibody against NOS in rabbits - what would you recommend? This antibody, ab6175, is known to react with bNOS in rabbits. does it work in mouse? Yes the antibody does cross react with mouse. Is this antibody is useful to detect expression of inducible nitric oxide synthase in paraffin embedded sections of human brain? Thank you for your help. This anti-NOS antibody has not, to our knowledge, been tested in paraffin sections, but we would be surprised if this antibody did not work in paraffin. It is an antibody that is well suited to immunohistochemistry and we have found it works well for human brain (frozen sections).